South Africa cantered to a 120-run win in the second one-day to clinch the ODI series. 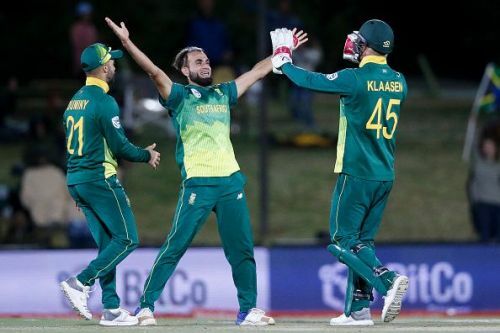 South Africa cantered to a 120-run win in the second one-day international to clinch the ODI series. Their bowlers clearly exposed the chinks in Zimbabwean batting department. Now Duminy' men the have chance to add another series sweep to their name if they beat hosts in the third fixture, when these sides clash for final ODI at the Boland Park in Paarl on Saturday, October 6. Proteas have now beaten Zimbabwe in each of their last 29 head-to-head ODI encounters. Africa's last defeat against their African brothers came in February 2000, at Kingsmead by 2 wickets. Since then, They have been absolutely clinical against Zimbabwe and have not even once allowed their opponents to dictate terms in any of the matches. The visitors have been absolutely clinical in this series especially in the bowling department. They won the first game by five wickets respectively, they secured a comfortable 120-run win in the previous match. Batting: The South African batting line-up has faced quite ups and downs in two fixtures. This can be proved by the fact that Dale Steyn was adjudged Man of Match in previous game for his batting performance as the comeback bowler went on to score first half-century of his career to put up a strong 75 run stand for the eighth wicket with Andile Phehlukwayo (28), after top order failed to put sizable contributions. While Heinrich Klaasen and Aiden Markram were in good touch in the first ODI. Both played sensibly in the low scoring encounter to lead the team with respective contributions of 44 and 27 runs. The team will be hoping for another strong display from them. Bowling: African bowlers have perfectly utilized the conditions so far. Their main bowler Imran Tahir has taken the most wickets in the series - eight in two matches - and he was the pick of the lot last time with figures of 6-24. While Andile Phehlukwayo and Lungi Ngidi have also been impressive on this tour with three and four wickets respectively. These three along with Dale Steyn will once again prove to be a major threat for the Zimbabwe batsmen. Expected Playing XI: Jean-Paul Duminy (C), Willem Mulder, Andile Phehlukwayo, Kagiso Rabada, Imran Tahir, Lungi Ngidi, Dean Elgar, Aiden Markram, Reeza Hendricks, Heinrich Klaasen and Christiaan Jonker. Zimbabwe aim to salvage pride in final ODI. The hosts have tried everything they could, but nothing has worked for them. Now they seem to have run out of ideas to overcome this threatening African bowling. Zimbabweans have failed to click as a unit and they have not been able to stretch the host bowlers at all. Batting: Zimbabwe relies heavily on their captain Hamilton Masakadza to lead from the front as other batsmen failed to contribute much throughout the series. He was the only batsman to get off to a start in both ODIs. Though he failed to convert them into big ones after getting out on 25 and 27 respectively and will be expected to get a big one in last ODI. Brendan Taylor is Zimbabwe's third-highest run-getter in ODIs and him along with Sean Williams and Elton Chigumbura will be the team's biggest hopes in the middle order. Bowling: Kyle Jarvis’ return from injury is a further boost, and he looked back to his best in claiming 2-26 from 10 overs in the second ODI. Tendai Chatara is their leading bowler so far in the series with five wickets. The team need these two to replicate their performance in final ODI. Expected Playing XI: Hamilton Masakadza (C), Craig Ervine, Brendan Taylor, Sean Williams, Peter Moor, Elton Chigumbura, Wellington Masakadza, Brandon Mavuta, Kyle Jarvis, Solomon Mire and Tendai Chatara.